“This union contract is completely unaffordable and out of line with state budget priorities. The list of new state spending being proposed seems to increase daily with no end in sight while at the same time the legislature is proposing new taxes on every item under the sun including the possibility of tolls. 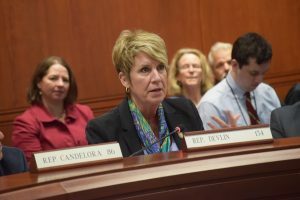 The middle class in getting crushed under this weight,” said Rep. Devlin. The contract was decided through arbitration earlier this week. In addition to a no-layoff agreement, the arbitration award between the state and the brand new bargaining unit created for 185 Assistant Attorneys General and 14 department heads results in more than $3.3 million in new spending each year. Included are $2,000 lump sum bonuses and base salary increases of 5.5% each year.